The smoothly running digestive system is crucial to an Italian’s health and happiness. 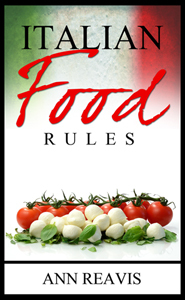 This concern is the basis of so many of the Italian Food Rules. You already know that you do not add uncooked milk to a full stomach (cappuccino, caffelatte, gelato); you do not eat “cold” melon without the “heat” of prosciutto or salt or peperoncino; you do not eat leftovers; and you do not overeat. Having eaten well, however, an Italian may partake of an herbal digestive drink after dinner. The first attempts to aid digestion using aromatic herbs and seeds steeped in liquids were made by the Greeks and Romans. Yet today, no country can match Italy for the sheer variety of digestive remedies available. They traveled from the pharmacies of the 1800s, intended as palliatives to counter all sorts of ailments and physical imbalances, to restaurants, bars and the dinner table in the 20th century. They are bitter – that’s amaro. These homemade restoratives, generally bitter herbs, plants and other botanicals blended into an alcohol base, live on commercially today in the form of digestives. Digestives are not the usual after-dinner drinks, like brandies, grappas and other distilled products that are meant to add a pleasant intoxicating after-note to a meal, or the sweet high-alcohol wines, like Vin Santo, which give you a final sweet taste, but not the fullness of a three-layer cake. These digestives, or digestivi, are known collectively as amari. The word refers to the bitterness that unifies this disparate group of liqueurs. Dozens of amari are produced in Italy. Each has a proprietary formula made by distilling a wide variety of herbs and spices and tempered in barrels or bottles. Amari have been touted in Italy to cure overeating, flatulence, hangovers, gas pains, cramps of all kids, baby colic and cholera. One theory is that bitterness, typically associated with poison, cues the body to accelerate the production of saliva and digestive juices. No two amari shares the same makeup or ingredients. 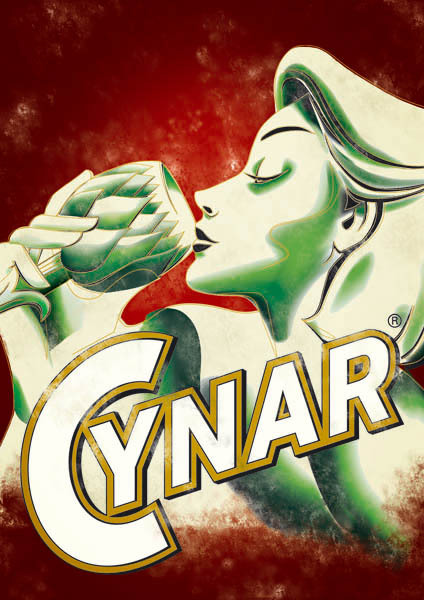 For example: Amaro Averna from Sicily is comprised of citrus, herbs, roots, and caramel; Cynar is an amaro made from 13 herbs and artichokes (Cynara scolymus), from which the drink derives its name; Nocino, is a digestivo made from green walnuts; Unicum, formerly a Hungarian amaro, contains 40 herbs and is aged in oak casks (the Zwak family, holder of the secret Unicum recipe, emigrated to Italy after WWII); Vecchio Amaro del Capo, a herbal and minty amaro is made in Calabria; and Fernet-Branca, probably the most world-famous amaro, is made from a secret recipe of 27 herbs obtained from five continents. 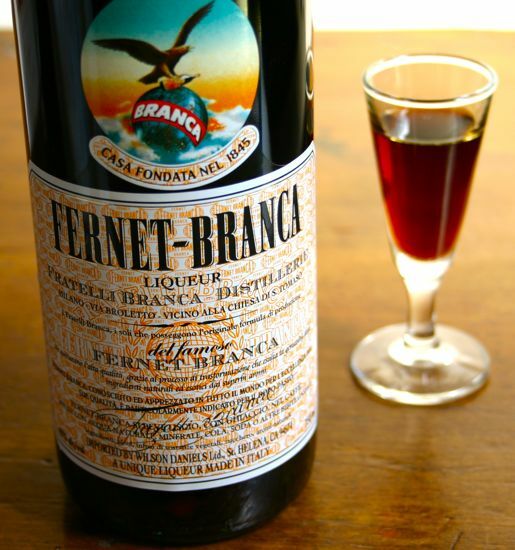 Fernet-Branca was created by a self-taught herbalist in Milan in 1845. The secret recipe for this digestive, first sold in pharmacies, includes aloe from South Africa, rhubarb from China, gentian from France, galangal from India or Sri Lanka, chamomile from Italy and Argentina, saffron, red cinchona bark, myrrh from Madagascar (yes, that’s right – myrrh), and elderflower. The brew is aged in oak barrels for twelve months. It is about 40% alcohol. Fernet Branca is considered by some as a perfect cure for a hangover, but Italians drink it as a digestivo after a long meal. Nocino is an amaro that can be found in most restaurants and ordered as a digestivo. 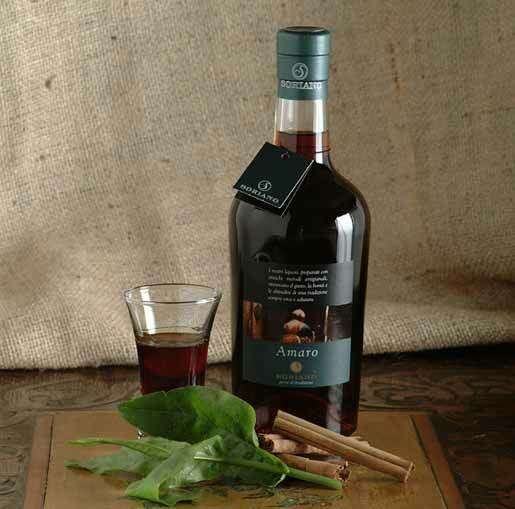 But it is also the most popular amaro for the home-made digestivo, probably because of the ease of its recipe. 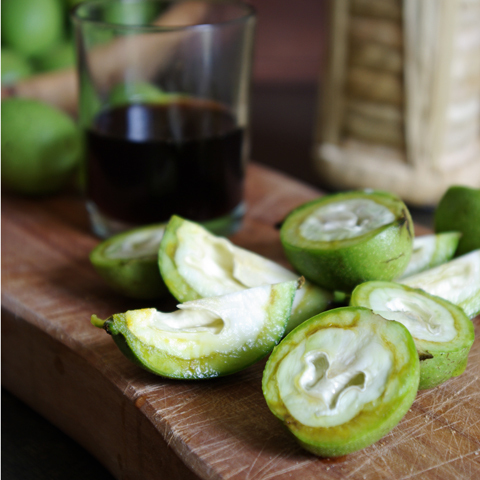 Its main ingredient is green walnuts picked long before they are ready to eat. The regions of Campania and Emilia-Romagna are the largest producers of walnuts in Italy. Traditionally, the walnuts are picked by a woman (there is a bit of the pagan about this concoction) on the eve of June 24th, the Festa di San Giovanni (St. John the Baptist’s saint day), the recipe is made the next day, after the noci have rested over night, and then the brew is put away until Ognissanti (All Saints Day), November 1st, when it is drunk to honor the dead. Thereafter, it is sipped as a digestivo after the big December holiday meals. To make Nocino, the walnuts (noci) are cleaned and quartered, put into round glass bottles with a mixture of alcohol, sugar, cinnamon, and cloves and allowed to rest in a warm sunny place. The liquid seeps into the nuts and turns dark brown. More sugar and spices are added and, if the liquid has become too strong, a little water is added. Pellegrino Artusi (1820-1911), the father of modern Italian cooking, reportedly suffered from a “delicate stomach” and noted in his seminal cookbook that the digestive and tonic powers of this dark and sweet liqueur were the perfect end to those heavier meals later on in the year when the cooler months arrive. Artusi’s Nocino contained unripe walnuts, alcohol (95%), white sugar, ground cinnamon, whole cloves, water, and the rind of one lemon. Sealed tightly in a large glass vessel, stored in a warm place, shaken “every now and then”, the concoction was ready in forty days or so. A couple of days before November 1st he would have a little taste. If it was too “spiritoso” (too high in alcohol), Artusi advised adding a cup or two of water. Then, when the liqueur is ready, strain it first through a cloth, and then to clarify it, again through a finer cloth or paper, such as a modern coffee filter, before bottling. Don’t succumb to the distasteful practice of doing Frent-Branca shots at your local bar in Los Angeles or New York in an effort to be cool. Sip a small glass after a four-course dinner at you favorite restaurant in Torino or Milan.